The policies on renewable energy dependence and climate change have encouraged development and utilization of renewable energy in the form of biomass and biofuels. Biofuels are expected to meet 30% global energy demand by 2050. Supply of renewable energy has increased by 0.3% in 2016 from 18.6% in 2014. Regions consuming high energy are shifting towards Biofuel such as Europe and North America, where North America emission has reached 7,370,905 ktCO2. Bioenergy is the largest renewable energy source accounting for 73% of all global renewable energy supply. Goldstein Research analyst forecast the biofuel market size is set to reach USD 246.52 billion by 2024 from the current USD 168.18 billion, growing at a CAGR of 4.92% over the forecast years. Global environmental concerns over carbon emissions are pushing the government authorities to develop stringent policies for a better livelihood. Shift towards renewable resources along with the low operational cost of biofuels are making a room for bioenergy. The report covers the present ground scenario and the future growth prospects of the biofuel market for 2016-2024 along with the statistics of the total production of biofuel. We calculated the market size and revenue share on the basis of revenue generated from major players in the biofuel market. We forecast the global biofuel market on the basis of growth in production and consumption of biofuels across the globe. Going on developments to produce economic biofuels further sustain the growth of biofuel market across the globe. On the basis of biofuel product type, major production share is for bioethanol which has increased from 4.5 billion gallons in 2000 to 21.8 billion gallons in 2012. Bioethanol is made from food crops rich in starch / sugar such as corn and sugar cane that resulted in the commercial-scale production of second-generation bioethanol from crop residues. Whereas, biodiesel production is lower than bioethanol but has increased from 213 million gallons in 2000 to 5.7 billion gallons in 2012 as this increase was dependent on development of new feedstock sourced from oil, such as cost-effective algal cultivation and oil extraction. 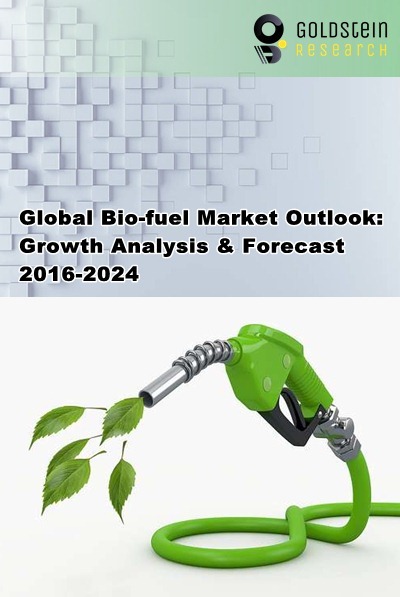 Global Biofuel market outlook 2016-2024, has been prepared based on an in-depth market analysis from industry experts. The report covers the competitive landscape and current position of major players in the biofuel market. The report also includes porter’s five force model, SWOT analysis, company profiling, business strategies of market players and their business models. Global biofuel market report also recognizes value chain analysis to understand the cost differentiation to provide competitive advantage to the existing and new entry players. According to our global market study on the basis of extensive primary and secondary research, “There is an emerging trend to produce biobutanol which has little or no impact on food supply and it is prepared through pyrolysis and reformulation of biomass. Though biobutanol technology is in infant stage and attracts the developments yet in 2016 it had a market worth over USD 5 billion. According to the report, the agreement on climate change in Paris at COP21 will drive the investments towards bioenergy in shifting from fossil fuels to renewable energy resources. Thus, the biofuel market needs this push to grow in the current scenario of degrading environment. For instance, other new feedstocks under development include Indian mustard seeds (Western Australia), Pongamia pinnata trees (Queensland, Western Australia), Moring oleifera (Western Australia) and algae (Queensland, South Australia, Victoria). Based on geography, Asia-Pacific consumes the highest amount of renewable energy of 30.4EJ, which is half of the total world consumption in 2016, where Brazil (41.4%), India (36.6%) and Indonesia (38.1%) have the highest share of renewable energy consumption. On the other hand, Europe is the largest exporter of the renewable energy, exporting 59EJ, dominated by pellets and liquid biofuels. Biodiesel markets are experiencing double digit growth in the United States and Asia, in particular India and China, where the government target is 15% replacement of petrodiesel by 2020. However, the biodiesel industry around the world since 2007 has been under pressure from higher priced feedstocks. Global biofuel market report comprises of the following companies as the key players in the biofuel market: Australian Renewable Fuels Limited, BlueFire, Ethanol Fuels Inc, Amiris, Bio Amber, Cosan, Coskata, Gevo, Archer Daniel Midland, Cosan, Fujian Zhongde Energy, Guangzhou Devotion Thermal Technology, Gushan Environmental Energy, Henan Tianguan Enterprise, Jiangsu Hengshunda Bio-Energy, Jiangsu Yueda Kate New Energy, Jilin Fuel Ethanol, Longyan Zhuoyue New Energy, Louis Dreyfus Commodities, Ningbo Tech-Bank, Petrobras, Shandong Jinjiang Bioenergy Technology, Shell, Tangshan Jin Lihai Biodiesel, and Zhenghe Bioenergy. Other high-flying vendors in the biofuel market are: Sapphire Energy, Lanza Tech, Cool Planet, Genomatica, Green Biologics, General Fusion, NexSteppe, Mantex. What is the revenue of biofuel market in 2015-16 and what would be the expected demand over the forecasted period?